The "Demon Star" Algol is among the easiest variable stars — perfect for beginner skywatchers to start with. Its naked-eye brightness dims noticeably for about 10 hours once every two days, 20 hours and 49 minutes, because a dim companion star orbiting nearly edge-on to Earth crosses in front of the much brighter main star. The highly predictable "minima of Algol" times tell you when to start watching the star return to its regular brightness. Everyone has seen stars twinkling in the night sky. The flickering is produced by turbulence in Earth's atmosphere that temporarily deflects the narrow beams of starlight before they reach our eyes. Twinkling occurs on timescales of fractions of a second. The phenomenon is strictly due to the air we're looking through — we're not seeing any changes in the stars themselves. But a large percentage of stars in the sky actually vary the amount of light they emit, resulting in changes to their visual brightness on timescales of hours, days or even years. In most cases, the changes are subtle. In fact, they weren't detected until astronomers began to take quantitative measurements of stars' brightness and saw differences from one night to another. These stars became known as variable stars. A handful of obviously variable stars have been known for millennia. In this edition of Mobile Astronomy, we'll look at an eclipsing binary star that changes in brightness enough for everyday skywatchers to detect it easily. It's Algol, nicknamed the "Demon Star," and it lies nearly overhead for mid0northern latitude skywatchers during early evenings. Perseus is a northern constellation that occupies the sky between the Pleiades cluster in Taurus and the W-shaped constellation Cassiopeia, high in the western evening sky during winter. It is shown here at 9 p.m. in your local time zone. Algol, also designated Beta Persei, is the second-brightest star in the constellation Perseus, the hero. This time of year, Perseus is already near the zenith (i.e., directly overhead) as soon as the sky becomes fully dark in early evening. It occupies the sky between the bright little Pleiades cluster in Taurus the bull and the distinctive W-shaped constellation of Cassiopeia, the queen. Astronomy sky-charting apps such as SkySafari 6 for iOS and Android will help you find Algol and the other stars I mention below. Perseus' brightest star, Mirfak (also known as Algenib or Alpha Persei), is easy to pick out because it's brighter than any other nearby star, except yellowish Capella, which sits about 19 degrees (or a span the size of two fists) above it. If you picture an imaginary line joining Mirfak and Polaris, the rest of Perseus consists of two strings of dimmer stars that start at Mirfak and diverge away from Polaris. Facing west, Algol is the medium-bright, blue-white-colored star sitting 9 degrees to Mirfak's lower left. The name Algol comes from the Arabic expression "ra's al-ghul," which means "the head of the demon." And yes, that's the same Ra's al-Ghul used by the character in DC Comics! In Greek mythology, Perseus slew the Gorgon Medusa, and the constellation depicts him carrying her severed head home, with Algol representing Medusa. Several nearby dimmer stars complete the head's outline. The constellation Perseus is traditionally depicted with the hero carrying the severed head of Medusa, as shown here in a plate from "Urania's Mirror," a boxed set of 32 constellation cards first published by Samuel Leigh of the Strand, London, in November 1824. Algol is the large star symbol at the top of Medusa's head. In ancient times, the star's obvious variations in brightness complemented the idea of the creature's supernatural nature. Most of the time, Algol shines with a steady brightness of about visual magnitude 2.1, which is easily within view of unaided eyes. But every two days, 20 hours and 49 minutes, Algol drops in brightness to visual magnitude 3.4 (an increase in magnitude value is a decrease in brightness), bringing it to the limit of naked-eye visibility from urban skies. No wonder the ancient Greeks associated Algol with a supernatural being. What's going on? Why does Algol vary in brightness? The star we see as Algol is actually a pair of stars located about 93 light-years from Earth; the two are orbiting so close to each other that they appear as one source of starlight to unaided eyes and small telescopes. The much hotter and brighter primary star is three to four times more massive than its cooler secondary companion, and emits about 26 times as much light. Astronomers estimate that the two stars are an average of only 0.06 astronomical units (AU) apart. (One AU is the mean Earth-sun separation — roughly 93 million miles, or 150 million kilometers.) That's a fraction of Mercury's distance from the sun! In an eclipsing binary star system like Algol, the total starlight received from a pair of neighboring stars dips whenever the dimmer star crosses in front of the brighter partner. Only systems in which the orbits are oriented edge-on to Earth yield the light curve shown at the bottom. The reduction in brightness during the secondary-eclipse geometry is normally much more subtle than shown here. The orbit of the dim secondary star around the bright primary star is oriented nearly edge-on toward Earth, and once during every orbit, it crosses between Earth and the primary star, cutting off (or eclipsing) some of that star's light. The brightness decrease lasts 10 hours, including the time required for the secondary star to transition onto and off of the primary star. The dimmest interval lasts about 4 hours. The entire process repeats every 2.87 days. Astronomers tabulate these "minima of Algol" and publish them in astronomy magazines and handbooks. For any given observer on Earth, some minima occur during daylight hours, making them unobservable. The useful CalSky website can predict the nighttime minima visible from your observing site. Navigate to the Deep Sky/Variable Stars/Predictions page, adjust the Start of Calculation and Duration settings (I like to use one month) and click Go. A daily list of minima (and maxima) times for prominent variable stars will be generated. This animation was assembled from a series of 55 images of Algol taken with the CHARA (Center for High Angular Resolution Astronomy) interferometer at Mount Wilson Observatory, using the infrared part of the spectrum (coloring the normally white star red). It shows the dimmer companion star orbiting Algol and passing in front of it — a classic eclipsing binary star system. The numerical labels range from 0.0 at the start of the orbit to 0.868 near the end of the orbit. Most of the time, Algol shines as brightly as the magnitude-2.1 star Almach, located 12 degrees to Algol's lower right. Because Almach doesn't vary in brightness, it can be used as a standard comparator to determine when Algol has dimmed. Stand in a location where both stars are in plain sight, and compare their brightness. You can also use binoculars to sweep from one star to the other and compare them. Algol and the comparison stars are bright enough that moonlight shouldn't interfere with your variable-star observations. 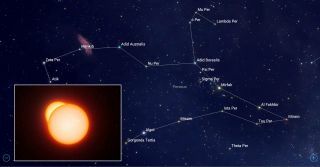 At its minimum, Algol is about equal in brightness to a modest star located just two finger widths to its lower left, named Gorgonea Tertia, or "third star of the Gorgon." By including this star in your observations, you can judge whether Algol is fully eclipsed. Gorgonea Tertia is also slightly variable, changing by 0.7 magnitude with a cycle of50 days, but it will serve our purpose here. The Feb. 24 and Feb. 27 opportunities are the most convenient. Once spring and summer arrive, the shorter nights won't really be long enough to watch Algol brighten — but autumn will bring additional months of perfect opportunities to see the Demon Star in action. Algol should vary in brightness this way for millions of years to come. So you have plenty of time to observe one of these unusual astronomical phenomena for yourself. Good luck! The SkySafari 6 app allows you to search for individual variable stars or highlight the entire list with blue circles. Tapping any star will summon details about its history, appearance and physical properties. This image shows the variable stars in the southern evening sky for 8 p.m. local time in mid-February annually. Once you have mastered observing Algol, you can try for other, more challenging variable stars. Lambda Tauri, another eclipsing binary star, cycles every 3.95 days, dropping in brightness for 14 hours each time. The 7-hour recovery is probably too long to watch in a single night, but a series of observations will reveal its changes. Some variable stars, such as Delta Cephei and Mekbuda (Zeta Geminorum), vary more continuously, as opposed to dipping in brightness. Use your astronomy app's search function to find them. The American Association of Variable Star Observers (AAVSO) encourages both seasoned astronomers and beginners to learn about variable stars and submit observational brightness estimates that are used by researchers in stellar astrophysics. The AAVSO's website is full of valuable resources, and the group has also produced the Variable Stars app for Android that includes the names and brightness of currently visible variable stars. There are short lists for beginners, full lists for experts and a searchable database. In upcoming editions of Mobile Stargazing, we'll highlight some winter binocular targets, look at how astronomers measure the distances to stars, show you some stars mentioned in science fiction and more. In the meantime, keep looking up!